1- Alisson Becker (Liverpool). Errors leading to goal concession leave a lasting stain on keepers. Which is why I thought thrice before naming Brazil number one custodian Becker as my choice. His excellent shot stopping more than compensates for kamikaze custodianship that resulted in conceding against Leicester City and Manchester United. Besides, his presence is a calming influence on a Liverpool side set to break Chelsea’s defensive record of 15 goals against from their 2004/5 title winning season. To date, the Kop have only let in seven thanks to Becker’s eleven clean sheets. You can’t contest such a record. 2- Aaron Wan-Bissaka (Crystal Palace): Before the season commenced, not many of us had ever heard of this teenager, but boy hasn’t he come good for Roy Hodgson’s Eagles. He has justified my decision to select him in my line up for Europe’s Best U-21 XI. Bissaka is such a natural. Those who’ve been around long enough should know his comfort on the front foot is a reminder of Brazil’s 1986 World Cup right back Josimar. 3- Andy Robertson (Liverpool): Former Manchester United manager Jose Mourinho was spot on in his assessment of Scotland international Andy Robertson, when in the aftermath of his side’s 1-3 capitulation to Liverpool, he complained about feeling dizzy from the frequency of Robertson’s marauding runs down the left hand channel. So solid have been this brave heart’s displays, diehard Liverpudians are choosing him over legendary Norwegian John Arne Riise. 4- Joe Gomez (Liverpool): Not even injuries sidelining upcoming Three Lions behemoth Gomez can stop me from naming him to my side. 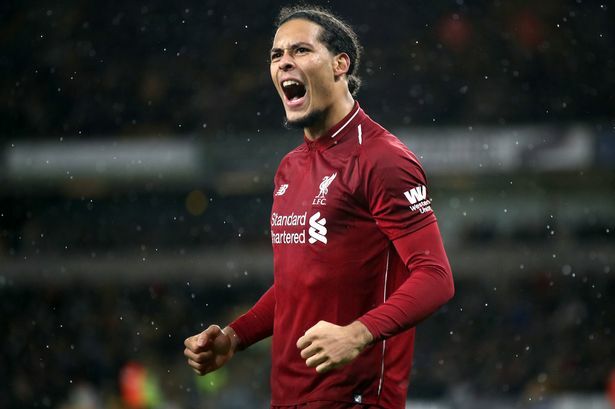 His timing in the tackle and recovery pace is why Liverpool have gone from defensive shambles to a side synonymous with synchronized stability at the back. It takes special talent for a 22-year-old to keep Croatia’s World Cup losing finalist Dejan Lovren out of Jurgen Klopp’s table toppers but Gomez is doing just that. He’s in my team ahead of Manchester City’s Frenchman Aymeric Laporte. 5- Virgil van Dirk (Liverpool): Easy choice. Netherlands manager Ronald Koeman has already handed van Dirk the national team’s armband. Klopp might have to follow suit. Virgil van Dirk is Liverpool’s on pitch leader; setting an example with his organisational prowess and determination to keep clean sheets. Liverpool’s defensive stats since signing this 6ft 5 inch Dutch machine more than justifies his £75m price tag as the world’s most expensive defender. 6- Fernandinho (Manchester City): Brazilian axle Fernandinho is part of a small elite of players making hay of their advancing age. At 32, this Samba Boy remains the English Premier League’s best holding midfielder. His protection for City’s back four, while simultaneously serving as a springboard for counterattacks is best noticed when he’s absent from the team. Fernandinho is the ‘ ‘Invisible Wall’ that makes Pep Guardiola’s well oiled juggernaut tick. 7- Raheem Sterling (Manchester City): Can’t wrap my mind around Sterling’s England bogey. Why can’t the English press just admit that the Three Lions inability to get the best out of Sterling has nothing to do with him. As this speed merchant showed in October’s 3-2 obliteration of Spain in front of their own fans, he is top drawer. If City are to retain their title, it will be in no small measure courtesy of his red-hot form. 8- Eden Hazard (Chelsea): Belgian star Hazard started the season like a rocket, briefly topping scoring charts, before a spell on the sidelines slowed him down. All the same, he leads the league for chances created and goal involvement. For Maurizio Sarri’s Londoners to qualify for next season’s Champions League, they need Hazard fit and firing on all cylinders. Simple as that. 9- Harry Kane (Tottenham Hotspur): I have Kane in this line up ahead of South Korean team mate Son Heuing-min because he is the club’s Mr Consistent. When Son was away at the Asian Games – where it was mandatory for him to win gold in order to avoid a year of military service, it was Kane who kept Spurs’ challenge alive. That said, Son will be a big miss when he leaves for national duty again next January. 10-Mohamed Salah (Liverpool): Egyptian Pharaoh Salah had a low key start to this campaign mostly due to the shoulder injury he suffered in last season’s Champions League final. But he’s now back with a bang and the Kop love him to bits. His twelve goals put him right in the thick of a fascinating race for the Golden Boot. I had to find a place for a man whose 44 EPL goals for Liverpool in just one and a half seasons make him a candidate for club folklore. 11- Pierre Emerick Aubameyang (Arsenal): If Unitéd legend Ole Gunnar Solksjaer was the baby faced assassin, then Aubameyang is the sneak sniper. The Gabonese striker is not an all action hero like Liverpool’s Roberto Firmino, but he is deadly effective. After match day 18, Aubameyang led the scoring charts with thirteen goals thanks to his predatory instincts that require neither numerous touches, nor high work rate.